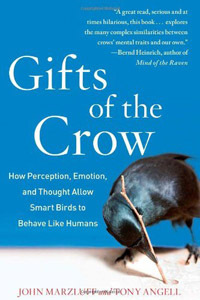 See – we really Aren’t the smartest creatures on the planet…..
Synopsis: Crows are mischievous, playful, social, and passionate. They have brains that are huge for their body size and exhibit an avian kind of eloquence. They mate for life and associate with relatives and neighbors for years. And because they often live near people—in our gardens, parks, and cities—they are also keenly aware of our peculiarities, staying away from and even scolding anyone who threatens or harms them and quickly learning to recognize and approach those who care for and feed them, even giving them numerous, oddly touching gifts in return.